It’s Friday, and I’m exhausted again. I don’t think I’ve fully managed to shed all traces of the heavy cold/chest infection I had last week, and I’m struggling a bit with the old energy levels. I’m beginning to think I’m supposed to be a hibernating creature (possibly also nocturnal); I definitely have a sense of slowness, and of battening down the hatches, as winter draws on. So long as I don’t start growing hair all over my body in the manner of a grizzly bear, I’ll be all right. But, in a break from tradition, I’m not going to go on (and on and on) about my tiredness today. I am tired, but it’s all good. I can cope with the tiredness because yesterday, my print-out of my WiP was delivered to me. It’s sitting here, in all its papery glory, on my desk. It’s just waiting for me to dive into it, crying out for the ink of my red pen. But – it’s huge. I shudder to think how many trees gave their lives so that I could edit in comfort. Ah! There’s Chapter Three finished. Now, where did I put Chapter Four? I realised, looking at it, that I’ve basically done three NaNoWriMo books, all in a row. My WiP is about 150,000 words, and it took me about three months to finish it. So, it’s no wonder I’m tired! (This is my last mention of tiredness, I swear). As always happens when I can’t access my WiP (which has been the case for the last week or so), I’ve spent most of my waking moments remembering things I want to change, or silly mistakes I’ve made. My phone is stuffed full of notes to myself along the lines of ‘You big eejit! Why didn’t you mention this very important, nay vital, plot point on page 130? Make sure to fix that!’, and similar. Hopefully, I’ll enjoy the final edit – though even the concept of ‘the final edit’ makes me jittery – and I’ll get through the work quickly. I used to spend weeks at a time marking up written work, mercilessly hunting down and destroying every last error, so I’m sure I’ll be able to handle a huge pile of my own work. Darnit, I’ve written a dissertation that was (marginally) longer than this document – I know I can do this. I’m sure – to make poor use of a quote from my favourite TV chef, Michel Roux Jr. – that my book is not ‘error free’, but hopefully it will be just that in about a week or so. Or, at least, as close to error free as I can get it. And then – what next? Well, I already have the seeds of a sequel to the WiP brewing away in my old brain-pan. And there’s the small matter of all those long-cherished ideas that I’ve had stored on my trusty old computer for many a long year, which might (hopefully!) get to live and breathe, if I can get a chance to write them. Some of those ideas are the ones included in my ‘Snippets’ pages, and some of them are shouting louder than the others, so hopefully I’ll get to them in order of importance. I hope in January I can put up a ‘Works in Progress’ page on the blog, to give you some idea of the projects I’m working on and get some feedback. But, until then, if you want me you’ll have to holler loudly – I can’t hear you through all this paper! This entry was posted in Writing News and tagged correction, editing, future work, revising, WIP, writing, writing process on November 30, 2012 by SJ O'Hart. A few posts ago, I mentioned that we’d (finally) purchased a box-set of ‘The Wire’, and that we’re slowly working through the episodes. We’re really enjoying them, and I finally understand why the show was so praised a few years back as being the best thing ever made for TV, and all that stuff. We’re still working through Season 1, so we’ve a long way to go yet, but I can already see the quality at work. Last night, as we watched an episode before bed, I was struck by something which I found important. One of the characters, Major Rawls, was throwing his weight around the workplace and, basically, bullying one of his junior officers into doing less-than-vital work; he was also trying to derail another investigation in favour of his own, and using bullying tactics to get his own way. There was another show on TV here a few months ago, too, where a man in the workplace was mercilessly bullied by his colleagues. The show gave the viewer an insight into how much pain this bullying caused, but – importantly – the bullies got away with it. It was downplayed as ‘teasing’ and made to seem like it was all intended to be good-natured, and that the victim overreacted to some old-fashioned joshing, but – of course – it was more than that. It made me angry to watch it. The truth is, of course, that this affects all of us, and that action needs to be taken by everyone. I can’t bear to think that a child, with loving parents and siblings, could possibly feel that nobody in the world cared about them enough to help them with their struggles against bullies. I can’t bear to think that they would feel so cornered and afraid that they think there’s only one option open to them – and that option isn’t talking to their mum or dad, or their brothers or sisters, or any adult in their life, but taking that irrevocable step into eternity. Every shred of me screams that this can’t be allowed to happen any more, but – like everyone – I’m helpless in the face of it. What can we do? The reason the TV shows I mentioned above made such an impression on me was because, in my opinion, the way they depict bullying is part of the culture of our times. The bullies in these shows are seen as nasty, certainly, and horrible; we root for the victim, and hope that he or she will battle through. But, a lot of the time, they don’t battle through – they just take the abuse, and walk away. 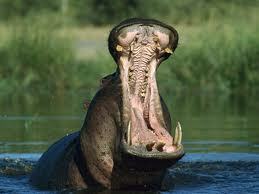 Their suffering is done away from the eyes of the bully, and away from the eyes of anyone who might be sympathetic. Bullying doesn’t just happen to children – I know what it’s like to experience bullying as an adult in a workplace, and it’s every bit as crushing then as it is during childhood. But children watch these TV shows, and they see bullies being depicted as strong and powerful, tormenting weaker people and getting away with it. They see characters manipulating their way to power, using strong-arm tactics to force other people to do their will, and they see a bullying mindset as being part-and-parcel of a strong character. I know these shows are fiction; I know that it should be clear that they’re not supposed to represent real life, and that people should be able to tell the difference. But maybe they just can’t, or won’t, tell the difference. A lot of people have experienced bullying, of some sort or another. Nearly every child gets teased while at school. I am no exception, but I wouldn’t go so far as to say I suffered badly. My memories of school are largely positive, and most of what could be considered ‘bullying’ happened to me while I was young and at primary school. But, no matter how bad any particular day might have been for me while I was at school, I had the comfort of going home at the end of the day, closing our front door behind me, and being welcomed into the warmth of my mother’s kitchen. I didn’t have to worry about the nasty girls in my class until I was back at school again the following day, facing them once more. There were no Facebook walls on which they could write horrible taunts, and I had no mobile phone, beeping constantly throughout the night, each message carrying abuse and horror. There was no You Tube for them to make videos, visible to the entire world, about how ugly I was or how nobody wanted to go out with me. I didn’t have to suffer any of this, but modern teenagers do. Of course, when I was young, I could torment myself with thoughts about what might have been said or done to me during the day, and I could worry about what might happen the next day, but it’s nothing in comparison to opening a text message and seeing words encouraging you to take your own life because you’re a worthless piece of trash. How could anyone cope with pressure like that? I couldn’t do it now, and I’m a grown woman. I certainly couldn’t have done it as a twelve-year-old. Bullying among children has been thought of as a ‘rite of passage’ for too long, and it’s often dismissed as something that kids just have to go through. That’s rubbish, in my humble opinion. Children who bully don’t just give it up as soon as they leave school – they can go on to bully throughout their lives. Children who are bullied can internalise all the abuse they’ve suffered, and it can scar them for the rest of their lives. Something does need to be done before the already heavy toll being paid gets heavier, and before more of our beautiful young people are lost. Something that can be done, by everyone, is to make it clear that bullying will not be tolerated in our presence, and that we do not reward bullying behaviour, either among children or adults. We can stop portraying bullies as heroes in TV shows and stories. We can give children who bully the same support as we’d give children who are their victims; children who bully can sometimes be in the depths of emotional turmoil themselves, and they bully because they need to exert some small bit of control over their lives. It’s not always as simple as ‘chastise the bully, and they’ll stop’ – if a child is bullying because they’re being bullied themselves, perhaps by a parent, then punishing them may only make their pain deeper, and they may take that pain out on their victims. Most of all, we need to watch our children and how they use the internet, and other media. We can’t patrol the internet, and we can’t remove the websites that children are using to bully one another – but, maybe, we can help children to see that bullying is not a mark of a powerful person, but a sign of powerlessness, and not something to be emulated. If we can discourage their need to do it, it’s a start in helping them stay alive and get through their adolescence without suffering so terribly. This entry was posted in Musings and tagged bullies in TV shows, bullying, cyberbullying, issues affecting children and teenagers on November 29, 2012 by SJ O'Hart. After the Great Book Cull yesterday, I decided to tackle another storage ‘issue’ that we’ve been having at home for the last few *mumble* months. I finally faced the two boxes full of random stuff from my parents’ house which have been sitting in a corner of my kitchen, taunting me and getting in the way, for far too long now. I think I was avoiding dealing with them not only because I’ve been very busy these past few months, but also because those boxes contained a lot of deeply personal stuff from my adolescence. They included a lot of documentation from my college application, notes from my first year at university, letters from old friends whom I haven’t seen in years, old art supplies (including dried-up paint, of which I have a Kristeva-esque phobia), and – inevitably – diaries. If only my handwriting was this neat! I had entirely forgotten I’d kept diaries from around the time of leaving school/entering college – it’s a time in my life I’ve largely blanked out of my mind, some of it deliberately, for a variety of reasons. It was a hard time for me, as I’m sure it was for most people. However, as soon as my hands fell on these diaries I began to wonder if, at some level, I’d known they were there, waiting for me in the boxes I’d put off dealing with for months and months. Certainly, as soon as my eye fell on them, I remembered exactly what they were, and I couldn’t bring myself to throw them away. They’re here, beneath my desk as I write, and I’m torn between reading them in full or just wrapping them back up and putting them away somewhere else, for a few more years. I read about old mates, some of whom I still treasure, and I read about a fight I’d been having at the time with a person who, thankfully, is now one of my closest friends again. I read about my first, tentative steps into life in Dublin, and remembered exactly how terrified I’d been at the time; I read about long-forgotten feelings I’d had for boys, and I read about pain I’d been going through at the time which I’d also, thankfully, forgotten about years ago. Some of these pages were easier to read than others, and not all the memories were bad, but I did have to put the diaries away after a little while, promising myself I’d come back to them again at some stage. What struck me more than anything else, though, was the shocking quality of my writing – I obviously figured myself as some sort of tortured artistic genius, and I peppered my entries with long words and flowery phrases, probably imagining that, one day, they’d be donated to a library or something. Such notions! I was quite embarrassed, actually, at the turns of phrase I’d used and the purpleness of my prose. It was nice, though, to read about my youthful dreams (which are, largely, the same as my current, more aged dreams); at least I’m still on the right track, even if I’d better get a move on in the ‘achieving my goals’ stakes. One of the sentences I did read lamented the idea that I could be ‘twenty-five and still in college’ if I wanted to achieve a particular life goal, which made me laugh. At the time I wrote the words, twenty-five seemed Methuselah-ish; now, it’s a dim and distant memory. It’s amazing the difference a few years makes on your perspective! Reading the diary extracts put me in a strange mood for the rest of the day. I was reflective, and perhaps even a little angry (though I wasn’t sure at what, or whom). Perhaps I was just annoyed that all those years have had to pass, and I’ll never again have the wide-eyed experience of my first solo trip on a bus, or my first glimpse of the sunlight glinting off the river Liffey. I guess memories are precious, even if some of them hurt to recall, and I’m sure in a few days, once the dust has settled (so to speak!) 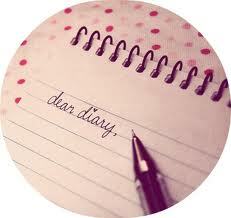 over these newly rediscovered diaries, I’ll be very glad of some of the experiences they’ll bring back to me. But I’m not doing any more tidying around the house for a while. It’s just too risky! This entry was posted in Musings and tagged aging, college, diaries, dirt, dust, experiences, grime, Kristeva, life-goals, memories, Methusela, perspective, storage, tidying on November 28, 2012 by SJ O'Hart. It’s happening today, I’ve decided. I can’t put it off any more. Everything I hold dear is resting upon it – my sanity, my marriage, my peace of mind. It’s time for a book cull. My husband is the kindest and best of men, and among the most patient – he needs to be, with me. He knew when we got together that I had an addiction to books, but it has only really become clear in the last little while exactly how bad this addiction is. I don’t think he can really understand the logic in me buying more books when there’s still an unread pile waiting for me; to this, I say there is no logic. It’s just the way I do things. I don’t have to read books in the order in which I buy them – if I see a book I’d like, or one I’ve been waiting for, or the next instalment in a series, or even just a pretty cover (I’m a sucker for a pretty cover), I’m going to buy it even if it means I’ll read the new one before one I already own. I refuse to believe I’m the only person who does this, but I’ve finally begun to realise how maddening it must be to live with someone like me. As a girl, I had books in every conceivable nook and cranny. Every drawer was piled with books, lying flat like babies in cradles; instead of socks in my sock drawer, I kept my Austens and Brontes. I had stacks of books in the end of my wardrobe, where most self-respecting teenage girls keep their shoe collection, and every inch of shelf space was taken up with displaying my Terry Pratchetts. Not for me the gew-gaws and trinkets of the average female teenage-hood – I had no interest (well, besides the occasional candle; I’m also a bit of a candle-freak). It’s been books, books, books all the way for me, for as long as I can remember. I think my parents were delighted to be rid of me, in many respects, once I grew old enough to move out of their house – the beams were probably just this close to snapping under the weight of my library. I gathered a whole pile of books around me during college, too – I reminded myself of Smaug, except it was paper I hoarded instead of gold. 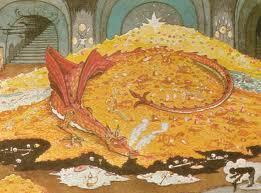 Where we differed was that, of course, I loved and cherished (and made use of) my books, whereas Smaug just jealously guarded his gold, without making any use of it, besides as a bed. Plus, of course, he’s a fictional dragon and I’m… not. I couldn’t help buying books, and I still can’t. It almost makes me feel guilty to leave a bookshop without parting from money, even just a small amount. It has happened that I’ve managed to enter a bookshop and leave it empty-handed, but so rarely that I can probably recall each episode off the top of my head. When I was young, and at university, and my time and (cramped) space was my own, I could buy all the books I wanted. There was nobody there to raise their eyebrow at me in a slightly disapproving way when I came home with yet another tome, and if my housemates were annoyed by my piles of books in our rented living room, they never said anything (not to me, at least). The only time my collection ever caused me any trouble was when the time came to move house, which did happen a few times during my younger years. But, just as a parent doesn’t leave a child behind when they move house, no book was left behind by me. I managed. It’s what I do. Now, I’m living in my forever-home. There aren’t going to be any more moves. My books are where they’re going to be for the rest of their natural life. But, it’s starting to come to the point where we can’t open our living room door because there’s a pile of paper behind it, refusing us access. Luckily, we don’t have an attic, because if we did, my books would have crushed us in our bed long ago. We’re the only people I know of who have a bookcase in their downstairs loo. I mean, some people have a pile of magazines in their downstairs loo, and maybe a few books piled in the window-sill, funnies to pass the time, that sort of thing. We have an actual full-size bookcase, with all the Penguin and Oxford Classics on the top shelves, followed by an assortment of novels and Norton Anthologies, children’s books and historical fiction, even The Onion Annual from 2005. Nobody really needs any of this stuff, but it’s there. About six months ago, we had the first book cull. It was akin to self-flagellation, for me; I did it, but I really didn’t want to. However, even I can admit that I made a bit of a pathetic effort – my husband cleared out a lot more of his old stuff than I did of mine. But now, even I have begun to eye up our bookshelves more critically, asking myself if I really need all this stuff. I don’t, of course – I just have an emotional connection to most of the books I’m hanging on to from college, for instance. I’m never going to read ‘Deformed Discourse: The Function of the Monster in Mediaeval Thought and Literature’ ever again (in fact, I’m not sure I even read it the first time), and so it should really be encouraged into the cull-box, ready to begin its new life in our shed, and – at some future point – to take pride of place in a second-hand bookshop somewhere. I know that if I’m to be allowed to continue with my book buying, that we need space to put them away; I know that I can’t help buying books, and that we don’t have an infinite house; so, therefore, the conclusion is inescapable. Some of them will just have to go. Just because I know it can’t be helped doesn’t make it any easier, though. Let’s hope I manage to clear more than one shelf before I break down in agonised tears, swearing to the books that of course I’m not going to throw them away – that can’t happen again! Wish me luck… and happy Tuesday to you! This entry was posted in Musings and tagged book addiction, book buying habits, book cull, books, bookshelves, clearing out, patient husband, second-hand bookshops on November 27, 2012 by SJ O'Hart. It’s what I deserve for crowing last week about how I was ahead of schedule with the WiP, I guess. Pride comes before a fall, and all that! There are one or two small things I want to change before I get it printed up for its final revision, but I don’t think I’ll be doing those changes today. Well, this is assuming I can keep myself away from the keyboard – something tells me the edits will be like spoiled brats all day, kicking at the back of my brain and whingeing about how they never get what they want, until I give in and just do them. In my medicinal haze this weekend, too, I found myself having some ideas about the sequel I’d like to write to this current WiP, and the first line of an entirely new story scribbled itself across my brain, entirely unbidden, just when I had nothing in reach with which to make a note of it. I wrote down as much of it as I could remember as soon as I managed to struggle towards a pen and paper, but something tells me it’s lacking the same sparkling intrigue as the words my germ-addled brain supplied me with. Hopefully, I’ll get back to it, one of these decades. This weekend, I finally got to watch some episodes of one of the most iconic TV shows ever made, and one which I’ve wanted to check out for some time. It was an unintended consequence of our attempts to start our Christmas shopping, which we did on Saturday. 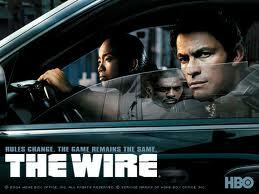 We weren’t very successful, mainly because I was delirious with fever, and couldn’t think straight due to the stupidly loud thumping music being played everywhere, but we did manage to pick up a box set of ‘The Wire’. I realise we’re about a decade behind the times with this one, but better late than never! It is just as good as everyone told me, but extremely different from what I’d expected. I suppose when you’re used to watching shows like ‘Law and Order’, cop dramas where the entire story arc, from crime to investigation to court appearance to sentencing all happens in one episode, a show like ‘The Wire’ seems almost soporific. I’m looking forward to learning from the show, though, as I’m sure it has lessons to impart about storytelling and maintenance of audience interest in characters and plot. Plus, one of the episodes we watched last night showed two of the officers examining a crime scene using only expletives to communicate with each other. It was, I have to admit, hilarious. In other news – it’s an utterly freezing, completely miserable day here. My husband just phoned to tell me he’s stuck in the longest traffic tailback he’s ever seen, and the news is full of reports about flooding, impassable roads, and terrible conditions. I suppose life could be worse, then, than having to wrap up warm and keep myself stocked with Lemsip. You’re never completely ‘switched off’ when you’re trying to write or finish a book, really, and I’m sure I’ll spend most of my day with my head in my WiP, trying to tweak it until I just can’t tweak any more. I am grateful, though, for the fact that I can do this without having to face the Arctic outdoors! I hope you’re all having a wonderful start to the week, and that you’re all in good health. Good luck with whatever it is you find yourself doing today! This entry was posted in Musings and tagged bad weather, editing, illness, recuperation, rest, The Wire, WIP on November 26, 2012 by SJ O'Hart. Why is it, when I come to the end of the week – when two days of fun-time open up in front of me – that I suddenly find I barely have the energy to drag myself around? Gah. I suppose it’s partly because I was awake until the dark heart of the night working on my WiP; I just couldn’t go to bed last night without tweaking just one tiny little plot thread, which then of course turned into a torrent of changes which got bigger and bigger and BIGGER until it ended up being mentioned again on the very last page, and had become a symbol for something very important. That’s the danger of writing a book, I suppose. It sort of takes you over, denying you sleep, peace of mind and meaningful conversation. I’ve been living, dreaming, sleeping this book and these characters for so long that sometimes it feels like I’m wearing a pair of those super-cool virtual reality goggles you see in movies. I’m not sure if my inner world or my outer world is the ‘real’ one, but either way, it’s fun, if a bit disorienting. The blog’s a bit late this morning because I made a cake first thing when I got up – it’s currently baking, and my whole house smells like chocolate, which cannot be a bad thing. I’m a reasonably recent convert to baking, but there are times, like now, when I’m so glad I have something else I can do which is creative and requires thought and precision, but which isn’t part of my fictive world. Of course, my brain still ticks away, my subconscious mind a bit like a hippo in a mudpool waiting to open its jaws and snap down on a juicy plot point, but when I’m baking I can feel, for a little while, what it’s like to be alone in my own head again. You will not escape me, tiny plot detail! Mwhahahaa! It feels great to be ahead of my own schedule with regard to the WiP. I do have some more tweaking to do – just adding or changing small details which will (hopefully) make the story more enjoyable and authentic (and won’t involve me staying up until the small hours!) – but it looks like next week I’ll have my hard copy in hand, ready to do the final edit. *bites nails* Hopefully, then, I’ll be able to have my book as finished as I can get it in plenty of time for my January deadline, and – shock – I might even be able to have Christmas off! Next January 16th will be an important day for me, for several reasons: firstly, it’s my cousin’s birthday, and she will be turning 18. I’m not quite sure how that happened without me noticing! Secondly, January 16th is the date when the shortlist for the competition I entered back in October will be announced, and the deadline by which the competition rules state I must have my full MS completed. So, on January 17th, I will either be celebrating because I’m a shortlisted writer, one step closer to being a published author, or celebrating because I can *finally* post up some excerpts from this dang WiP of mine on this blog, and get some opinions from anyone who wants to stop by. I’ve been nervous about putting up details so far, just in case it contravenes the rules in any way, but I’m really looking forward to letting my idea out into the world, in whatever fashion I can. After January, the fun can really begin. After January, my path to publication will really kick off, and (of course) I’ll be writing about it here, and hoping you’ll all hold my hand along the way. If I’m lucky, the competition will give me a kick-start, but even if I don’t get shortlisted, I’m still lucky. Taking the decision to write this book and making the necessary life changes to achieve that goal was the best thing I ever did (besides get married). I’m excited by the future, and it feels great. I’m exhausted right now, but I know all the hard work I’ve put in will pay off next year, in one way or another. Thanks, everyone, for being here with me this far – I hope you’ll stick with me on the next part of the journey. This entry was posted in Writing News and tagged competition, deadline, editing, subconscious mind, thought processes, WIP, writing on November 23, 2012 by SJ O'Hart. I woke up this morning tangled up in my sweaty sheets, looking a lot like a panicked sausage roll, in the grips of a nightmare so real that it took at least a minute to clear fully from my mind. The horror of it paralysed me, and my heart was thumping so hard that I thought it would burst. I found it hard to catch my breath. The last image from my terrible dream lingered in front of my eyes like the distant shimmer of the Aurora Borealis. I dreamed…*deep breath* I dreamed that Stephen King was just about to publish a book with the same title and plot as my WiP. They were making a movie out of it, and I even dreamed I saw the TV ad for the movie – this was the last image in my nightmare, the shimmery one that hung in front of my eyes – and I woke up screaming, internally, at the unfairness of it all. I told my husband, who very sensibly muttered ‘It’s not really his type of book, though, is it?’ (I don’t think he was too impressed by my angst at that ungodly early hour of the morning); after a few moments, the logic of this settled into my mind, and I calmed down a bit. Anyway. I guess all the dream really signifies is that 1) I can’t get this book out of my mind, and 2) I am really, deeply, devotedly attached to it. Neither of these things are bad – in fact, I should be glad to feel like this, still. I know I’ve only been writing this story for a few months, but like I’ve said before the story has been in my brain for a long, long time. If I was a normal person, I’d be sick and tired of it by now. I read a lovely blog post this morning about writing the book you want to write, and how it’s a good thing if your book is in your mind all the time, and you can’t stop yourself thinking about your characters; it couldn’t have been more timely, really. I’ve had a fortifying cup of coffee, and now I’m just about ready to start work again. I have a ream of notes here, made yesterday when I was away from my desk – every few seconds something about the book would occur to me, and I’d have to scramble for pen and paper, or my phone, in order to write something down. Thankfully I’m not relying entirely on my colander-like memory to preserve all the things I want to remember, and all the important details that need to be added to the book. At this rate, my WiP will be leaving ‘Under the Dome’ in the shade in terms of length (but hopefully it’ll have a less frustrating ending!) I’m just over half-way through my third edit, so soon it’ll be time to print myself a hard copy and swan around with my MS under my arm for a bit, just because I can. I hope you’re all having a less manic day than I am, and that all things are well wherever you are. How is everyone’s Thursday going? This entry was posted in Writing News and tagged editing, nightmare, reading, Stephen King, stress, Under the Dome, writing, writing process on November 22, 2012 by SJ O'Hart.